UPDATE: Atlanta, GA. (October 3, 2018) – The Salvation Army’s national network of disaster staff and volunteers have been activated since Monday, September 10, to mobilize for storm preparation and response. Trained emergency disaster personnel are prepared to provide food, hydration, and emotional and spiritual support to survivors and first responders. 90 assigned Mobile Feeding Units (Canteens) and 36 in service. 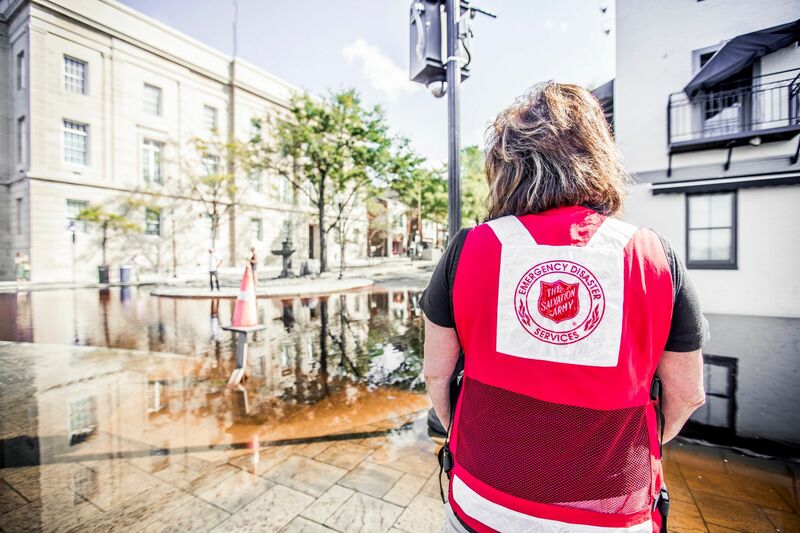 (Original Post) Alexandria, VA. (September 14, 2018) – The Salvation Army’s national network of disaster staff and volunteers has been activated since Monday, Sept. 10, to mobilize for storm preparation and response. Trained emergency disaster personnel are prepared to provide food, hydration, and emotional and spiritual support to survivors and first responders. Staff and volunteers are also serving at emergency shelters and staffing emergency operations centers. An incident command team and staging area for North and South Carolina has been established in Charlotte. The Salvation Army has committed more than 60 mobile feeding units across four states to Hurricane Florence relief operations. Each canteen can provide up to 1,500 meals per day. The Salvation Army is also working closely with other charitable disaster responders, such as Operation BBQ Relief, who is staging a kitchen alongside Salvation Army units in Charlotte. As of Sept. 14, The Salvation Army has provided more than 8,000 meals, 6,500 drinks and 5,000 snacks. Because The Salvation Army has more than 7,600 centers of operation in the U.S., they’re often the first ones on the scene. And they don’t leave – as part of the communities they serve, they help people recover now and later rebuild. A digital media kit with b-roll, fact sheet, photography and social media assets can be found here. The Salvation Army, established in London in 1865, has been supporting those in need without discrimination for more than 135 years in the U.S. More than 25 million Americans receive assistance from The Salvation Army each year through a range of social services: food for the hungry, relief for disaster victims, assistance for the disabled, outreach to the elderly and ill, clothing and shelter to the homeless, and opportunities for underprivileged children. The Salvation Army tracks the level of need across the country with the Human Needs Index (HumanNeedsIndex.org). The Salvation Army has served survivors of every major national disaster since 1900. The Salvation Army does not place an administrative fee on disaster donations – during emergency disasters, 100 percent of designated gifts are used to support specific relief efforts. For more information, go to SalvationArmyUSA.org or follow on Twitter @SalvationArmyUS.